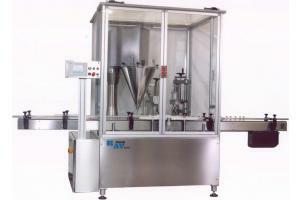 Model RAV05 (NW) is a machine for dosing the powder and closing the bottles. As an option, the machine can be equipped with a net weight control system (Net Weight) with automatic feedback. RAV05(NW) is a powder filling and machine for macrodosing. Bottles positioning by high density POLYZENE star wheel. Container size up to  80 mm. H 240 mm. Electrical and logic controls located inside a stainless steel box, beside the machine. Two programmable speeds for approaching and closing in up/down movement. Logic controls based on PLC Siemens S7 CPU 1200 with special modules for axis control, net weight system and quick counters. Operational Panel Touch Screen Siemens SIMATIC with alarm list, setup function and sensitive areas. N.2 load cells with capacity of 400 gr. (different on request) and accuracy of 4000 steps for the whole range, equal to 0.1 gr. Check weight system by SIEMENS SIVAREX U with digital filters to compensate vibrations: each bottle is checked before filling and after filling and capping: net weight is calculated. Nominal output: Up to 50 pz./min. Hopper capacity 35 lt. or 50 lt.